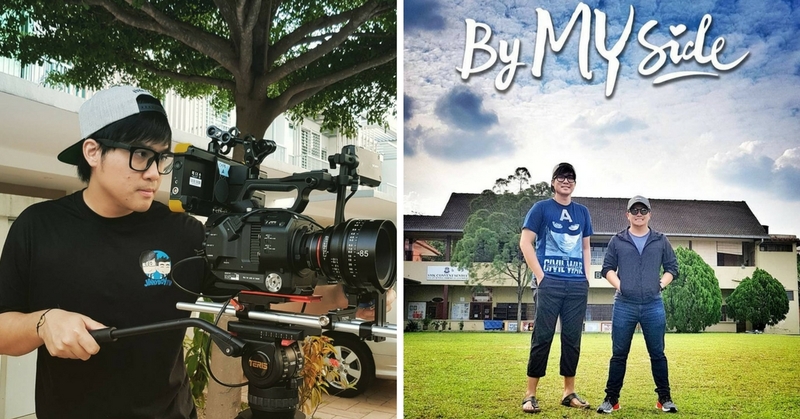 Prepare to be bombarded with nostalgic memories from your childhood past this Malaysia Day, whereby Tonton will be premiering JinnyboyTV’s first ever featured film, titled By My Side. YouTube content creators turned film executive producer and director, Jin Lim and Reuben Kang, linked up with Tonton, on producing their first ever movie featuring Brandon Ho and Marianne Tan playing childhood buddies who became lovers, with online stars supporting cast such as Josephine Yap, Arwind Kumar, Nadia Nash, Adam Shamil and Maggy Wang. We are honoured to be invited by the team to have a glimpse on what’s happening on the set and also had an amazing interview session on what they are pursuing with this movie and what Malaysians should be expecting for this film. What inspired you to begin your own video production house and how it ended up to produce your very own first movie? Jin: It started off when I told my wife that I needed someone who knows how to do slow-motion videos with his or her expertise, for videos to look superbly awesome and out of the ordinary. That is when I met my pal, Reuben here. Reuben: Ya before Jin approached me here, I was doing all sorts of commercial in the film industry. Until one day, he sought me out for his interest in producing YouTube videos which I thought it was quite a cool project. So we initially started small with just a DSLR and a monopod and few of our friends helping out. We have been doing this for quite awhile and we thought to ourselves: hey, why don’t we make our first movie? How did your collaboration with Tonton first started? Jin: Tonton approached us a year ago about making a movie as they are always looking for bright minds and talented individuals in social contents for their filming industry. We got into negotiations with them that we wanted to do a 20 minutes short film at first, but then it got extended to maybe 40 minutes, and finally they came to the conclusion on wanting us to make a full fledged movie. So we decided to just give it a go. It takes a lot of work to produce a movie and we weren’t that confident on such a big project, but we got to push ourselves to take our production to another level. About the film, how did you get the inspiration for the movie? Reuben: We would like to make a movie while maintaining our JinnyboyTV style but at the same time, we would like to do something meaningful and memorable which can relate to our daily Malaysian life and also to ensure that this is an amazing story worth telling. Jin: Exactly, we want to keep this story as real as possible, something that can be related to each and every individual through our friends, families, colleagues and ourselves. Between both of you, which one of you are more of the OCD type? Jin: It’s Reuben definitely. Actually we are both OCD in our very different ways. Reuben: Jin’s OCD is that he cares more on the entertainment quality, how much it would impact and attract the viewers, while I am more towards the content of the story, as in storyline and the progress of the story. I always wanted to keep it to our Malaysian lifestyle and Malaysian English because it is just who we are as proud Malaysians. Any shout outs to your fans out there regarding this movie? Jin: Ya! Don’t be cheapskate. We made this movie for you, so subscribe to Tonton and watch it to support us okay? Reuben: To the amazing people that have been following us for so long, this is for you and we are making it for you, and we will continue to grow in our production. What’s the primary message of this movie? Jin: No matter where we go or travel around the world, we would always look back thinking about the unforgettable memories we have been through in the past. As a Malaysian, yeah we might have some dream places to go as wanderlust but in the end, we will eventually miss the beauty and cuisines of Malaysia, that’s the idea behind our story and the title for our movie, By My Side. In the end, we will never forget about our first love and our first love will always be our country and that’s the main idea for our movie. How does it feel like to work alongside with such a fabulous actress like Marianne in your first film ever? Brandon: It is a great blessing to act side by side with her in my first ever major film and honestly it was something I can’t even imagine I would experience. To be working alongside her has made me insanely nervous and all I could think was how poorly will I perform beside her but it is also a good thing for me to push and challenge myself to be at the same level with such an amazing human being. Though she might be intimidating at times, I couldn’t ask for more and grateful to be working by her side. Is there any part of the film that connects personally to you? Marianne: Yeah absolutely, especially the long distance relationship between Faye (Marianne’s character) and Ben (Brandon’s character) is what I have been gone through in my life and I felt that a lot of people have dealt with that too in their teenage years. The emotion and feeling of being faded from someone’s life is something that is relatable in our high school days. Brandon: Ben and I are not so different afterall. He was really in love with Faye as we could see that he was resisting to leave Faye to study overseas. I have experienced the same thing before and to showcase that emotion on the big screen through my character’s affection for Faye is definitely relatable to my fellow Malaysian youngsters out there. Is there any funny or embarrassing moments during the film? Marianne: Ahaha, I remembered there was one scene where I was suppose to smile happily and frown sadly, but then my face started getting weird cramps and ended up making an awkward funny face which everyone laughed at me. Do you have any message for the audience to takeaway? Marianne: I definitely want the audience especially the girls to know that if you have been plunged a hole through your heart, it is not worth it and you should come to love yourself and come to terms with all the despair. Brandon: I think we feel that every Malaysian who watch this movie will feel very connected and relatable to our past and present life regardless of your age and race. The essence of this movie is just so Malaysian; it is a Malaysian based film, it is acted by Malaysian actors, and it is produced by Malaysian filmmakers that we want to watch, laugh and cry together as a united nation.